We think there’s no better way to explore the Whitsundays than to take a relaxing and scenic boat cruise through the magnificent islands and reefs. There’s a whole host of options for you to choose from including day trips, bare boat and skippered charters. There’s a range of day trips leaving the mainland and large resort islands so you can visit a few of the 74 Whitsunday Islands all in a day. Many of these cruises allow for you to snorkel at various reefs and include lunch and drinks. Bare Boat charters are especially popular in the Whitsundays as you can be captain of your own trip on your holiday. It allows visitors more freedom in their holiday as you can set sail to wherever you heart desires and wake up to sparkling azure oceans. There’s a range of yachts, catamarans and motor launches of various sizes to suit every budget. You can also choose to hire a crew so you can relax day in and day out in luxurious surroundings. Please see our list of recommended Whitsunday Boat Cruise experiences below. For more cruise providers, check out Whitsundays Boat Cruises in our local directory, or click the banner to the right to book a cruise and start sailing! 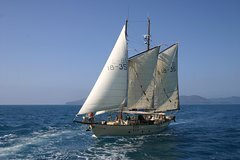 Sail the Whitsundays in a 62-ft gaff rigged schooner. Help out with the sails or chill on deck as the sails fill in the breeze. Head for the Whitsundays' iconic beach - Whitehaven. Disembark at Tongue Bay for a 10-minute walk to the Hill Inlet lookout. Capture some pics of the world's most photographed beach before heading down to experience the soft, white sand. Spend an hour and a half on the beach before heading back for lunch on board as you head for a beautiful snorkelling spot where the water is teaming with fish and the coral is dazzling. Then it's homeward bound while snacking on a fruit and cheese platter and the sails carry you back to Abell Point Marina. Choose the unique overnight resort stay package around the Whitsunday Islands. The all-inclusive combo departs from Airlie Beach and offers an exclusive night’s accommodation at the multiple award-winning Paradise Cove Resort. The custom-built vessel offers a comfortable and smooth ride to Whitehaven Beach, Hill Inlet Lookout and snorkeling at pristine locations on the fringing Great Barrier Reef. 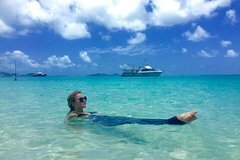 The vessel allows passengers to arrive at the destinations quickly with more time for activities such as sunbathing, swimming and exploring the Whitsunday Islands. Cruise with Whitehaven Xpress (Established 1989) from Airlie Beach which includes the famous Whitehaven Beach BBQ with steaks and meats cooked to order! Visit the spectacular Hill Inlet Lookout and participate in Snorkeling or the Glass-bottom boat tour of fringing reef systems. This vessel has indoor, semi-outdoor and rooftop seating which is the key difference to the various options available. Courtesy Pick-ups & drop-offs in AC Buses are included. This day tour is an authentic "Aussie" experience! This company is the longest running day tour to Whitehaven Beach and is family operated with Terry, Jill, Capt Dan, and Capt Shane providing personal service. 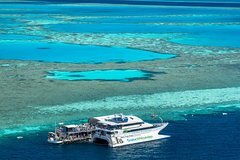 Do you want to experience a close encounter with the famous Great Barrier Reef, then this is it! Enjoy a cruise out to the reef, where you'll moor up next to Heart Pontoon. From this innovative and spacious pontoon, you can snorkel and dive the tropical waters until your hearts content. Top up you tan on the sun decks, see the reef up-close without getting wet with a ride on a semi-submersible, and learn about the marine life through presentations by reef experts. There's no better way to experience the reef! Enjoy relaxing on the pure white sand of Whitehaven Beach. You can walk along the seven kilometer stretch of natural silica sand, swim in crystal clear water or lay back and read a good book. There is no better place to unwind then finding your own slice of paradise and feeling the ocean breeze sweep over you as your body melts into the sand. The only way to truly experience one of the world's best beaches is in style and comfort aboard a large, high-speed and air-conditioned catamaran. A true sailing experience through the Whitsunday Islands on board the rare Australian classic yacht Lady Enid. 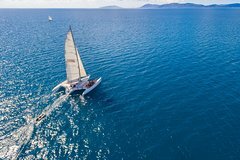 Become involved as much or as little as you like, help set the sails, take a turn at the helm or lean back and relax and enjoy the uninterrupted beauty of the Whitsunday Islands. 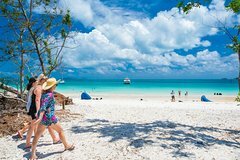 Barefoot luxury at it's best, sailing to one of the world’s best beaches, Whitehaven Beach and visiting Hill Inlet, swimming the crystal clear waters of Betty's Beach at Whitehaven and snorkeling the Island Reefs will certainly ensure beautiful memories are made. Your crew will welcome you as their guests, not just a passenger and with only a maximum of 24 guests and up to four crew at your service, you will want for nothing more. The gourmet meals are certainly a feature of this experience, including morning tea, lunch, afternoon tea and as you'll sail back to port into the sunset while a glass of sparkling wine and antipasto is served. Avatar Whitsundays is the only commercial sailing trimaran in the Islands. What does this mean for you? Minimal lean while sailing, maximum deck space with nets for sun baking, you can soak up the stunning World Heritage-listed Whitsunday Islands while never feeling over crowded. Just the way it’s meant to be. Avatar caters to guests between 18 and 35 years old and the young at heart. She Sleeps 26 guests and 3 crew in a mixture of open plan bunks and private doubles . All meals are freshly prepared on board and include home cooked roast with trimmings and gravy, spaghetti bolognese, pies, fresh meats, salads, breads, fruits, dips and crackers Plus loads more! You wont go hungry! Spend a full day exploring Whitehaven beach, one of the most beautiful beaches in the Whitsunday Islands. You’ll enjoy a guided hike to Solway Circuit Lookout and chance Bay, and take a leisurely hike to Hill Inlet lookout where you get a famous view of Whitehaven beach! Swim away from the crowds, and have time to lounge on the beach. Your day trip includes a guide, lunch and afternoon tea with a group tour limited to 32 people. 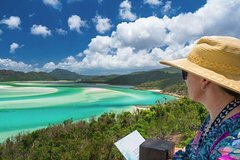 Sail through the Whitsunday Islands and explore magnificent Whitehaven Beach, voted one of the world's best beaches on this full-day sailing adventure from Port of Airlie. 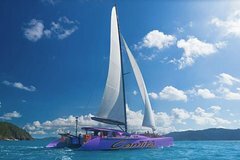 With the thrill of high-speed sailing through the famous Whitsunday Islands, swimming and visiting the world famous Hill Inlet Lookout this full day of fun and adventure is the ultimate Whitsunday Islands experience. Spend the day at sea, sailing, snorkeling, beachcombing and enjoying the Whitsunday Islands' spectacular natural beauty. Go snorkeling at a protected beach and enjoy morning tea with chocolate cake, a buffet lunch and afternoon hors d'oeuvres, freshly prepared on board. There’s plenty of room to relax on the tallship’s large deck, ideal for calm sailing in the protected waters of the Whitsundays' fringing reefs. Combining adventure on the high seas, snorkeling and a non-stop smorgasbord of food, a tallship cruise is the best way to experience the beautiful Whitsundays Passage in one day. With numbers restricted to less than 40, you can sit back and relax or join the crew and try your hand at raising the sails! Multi award winning Whitsunday Jetski Tours offers exciting adventure tours in the Whitsundays and is the first and only guided jetski tour operating from Abell Point Marina, Airlie Beach to the Whitsunday Islands. Guests can ride the latest model Sea-Doo jetski into the beautiful world heritage Whitsunday Island Marine Park. Four tours operate daily, the Airlie Adventure, also known as the ‘Turtle Tour’ with sea turtles often encountered, the Two Island Safari, exploring the waterways of South Molle and Daydream Islands, the Jetski to Paradise, a jetski adventure visiting exclusive Paradise Cove Resort and the Ultimate Island Trek, an epic jetski journey to the island oasis of Palm Bay Resort. No license is required and no experience is necessary! Visit three top destinations whilst having the ride of your life! Each Ocean Rafting day includes an exhilarating ride to world famous Whitehaven Beach, Hill Inlet Beach and Lookout, pristine snorkelling reefs and guided Whitsunday Island National Parks walks, all in one day! The semi rigid inflatable vessels are super fast allowing you to experience a fun ride, adventure and education amongst the natural beauty of the Whitsundays. Ocean Rafting offers two different Whitehaven Beach tours to choose from, the Northern Exposure and the Southern Lights tour. The significant difference between the two tours is that the Northern Exposure offers more snorkelling time and the Southern Lights offers more beach time. Ocean Rafting is the only tour operator to have direct access to the stunning and iconic Hill Inlet beach and special snorkel sites at Hook Island and Border Island ensure a memorable underwater experience.